When it was released in 2014, Middle-earth: Shadow of Mordor (Warner Bros. Interactive Entertainment) proved to be the game all Tolkien fans had been waiting for. Its sequel, Middle-earth: Shadow of War, released in 2017, improved and expanded the first game. Besides all the orc-slaying action, the game has a bunch of other activities, including the most staple of gaming side quests: collectibles. Simply put, collectibles are items scattered throughout the game and completionist gamers go crazy hunting them. In most games, collectibles do very little or even nothing at all, but in Shadow of War, they reveal little tidbits of the game’s lore. When dealing with any Tolkien-related story, we fans are always happy to have more information about the setting and this makes the collectibles in Shadow of War rather enjoyable. One of these collectibles, a fossilized squid’s beak, immediately and inevitably caught my attention. Since this fossil deserves more time in the spotlight than what it got in the game, I have devoted this article to analyze it more thoroughly. Figure 1. The fossilized squid beak found in Middle-earth: Shadow of War. Credit: Monolith Productions / Warner Bros. Interactive Entertainment; screenshot from the game. The item is named a “Kraken beak” in allusion to the well-known fact that real-life giant squids were the origin of the Kraken myth (Salvador & Tomotani, 2014). So the characters in the game recognize they are dealing with a “giant version” of their common squids. But what exactly is a squid’s beak? And can fossil beaks really be found in our planet’s rocks? To answer these questions, we will need a little primer in squid biology. Squids are animals belonging to the Phylum Mollusca, the mollusks, and more specifically to the Class Cephalopoda. Cephalopods are very diverse creatures and the group includes not only squids but also octopuses, cuttlefish, nautiluses and two completely extinct lineages: the belemnites and the ammonoids. Cephalopods live in seas worldwide (from the surface to 5,000 m deep) and are represented by over 800 living species; the fossil record, on the other hand, counts with 17,000 species (Boyle & Rodhouse, 2005; Rosenberg, 2014). The first cephalopods appeared over 450 million years ago during the late Cambrian (Boyle & Rodhouse, 2005; Nishiguchi & Mapes, 2008). They achieved an astounding diversity of species during the Paleozoic and Mesozoic eras, but some lineages (ammonoids and belemnites) are now extinct (Monks & Palmer, 2002). Today, we have two distinct groups of cephalopods: the nautiluses, a relict group with just a handful of species, and the neocoleoids, a latecomer group that appeared during the Mesozoic and includes cuttlefish, octopuses, and squids (Boyle & Rodhouse, 2005; Nishiguchi & Mapes, 2008). Squids are soft-bodied animals and their body is divided into three parts (Fig. 2): (1) the mantle, where most organs are located; (2) the head, where the eyes, brain, and mouth are located; and (3) the eight arms and two tentacles (the latter usually look different from the arms and can be much longer). Figure 2. Diagram of a squid, with the names of their body parts. Credit: Barbara M. Tomotani; image modified from Salvador & Tomotani (2014: fig. 7). The mouth of the squid is on the center of the circle formed by the arms. It contains a pair of chitinous mandibles, which together are called a “beak” because of their resemblance to a bird’s beak (Fig. 3). Squids hold their prey with their arms, draw it towards the mouth, and take small bites off it using the beak. The beak and mandibles move by muscular action – they are connected by jaw muscles within a globular organ called “buccal mass” (Nixon, 1988; Tanabe & Fukuda, 1999). Figure 3. Example of a squid: a (dead) specimen of Doryteuthis sanpaulensis (Brakoniecki, 1984). Top: whole animal. Bottom left: mouth region (in the center of the ring of arms). Bottom right (upper inset): close-up of the mouth; the beak is barely visible. Bottom right (bottom insets): beak (removed from the specimen) in frontal and lateral views. The specimen is deposited in the scientific collection of the Museu de Zoologia da Universidade de São Paulo (São Paulo, Brazil) under the record number MZSP 86430. Photos by Carlo M. Cunha; image reproduced from Salvador & Cunha (2016: fig. 6). Usually, the only parts of an animal to become fossils are the mineralized (and thus hard) skeletal structures, such as bone, teeth, and shells. Squids are almost completely soft-tissue animals and so are only preserved in the fossil record in exceptional circumstances. The beak of a squid is not mineralized; rather, it is composed only of organic compounds such as chitin (the same substance found on insects’ exoskeleton) and proteins (Miserez et al., 2008). Nevertheless, the beak is reasonably tough and thus, it can become a fossil under the right circumstances. Indeed, several fossil squids (and neocoleoids in general) are known only from their beaks (Tanabe, 2012; Tanabe et al., 2015; Fig. 4) or their internal vestigial shell. Therefore, it is plausible that a fossil beak of a squid could be found in Mordorian rocks. It could be argued that the fossil presented in the game is not morphologically accurate, especially the frontal part of the beak, which seems to be a single piece instead of two (Fig. 1), but we can disregard this here and accept the Mordorian fossil for what the game says it is: the remains of a squid that lived long ago. The game’s description of the fossil implies that the animal would be huge – but how can we know the size of the animal only from its beak? And how big can a squid get anyway? I will try to answer those questions now. Besides Idril’s comments about the fossil in Shadow of War and how large the actual animal must have been (“several hundred feet”), we have no real indication of the fossil’s size – no scale bar alongside its depiction, for instance. Knowing the actual size of a squid’s beak allows scientists to estimate the animal’s size, based on data from recent species. For instance, Tanabe et al. (2015), described a new squid species based on a fossilized beak (Fig. 4). They named it Haboroteuthis poseidon and, by its lower beak of roughly 7 cm, estimated it to be the size of a Humboldt squid (Dosidicus gigas d’Orbigny, 1835), with a mantle length of 1.5 m – a giant in its own right. However, nature does not disappoint us in this regard and we have two amazingly huge species, aptly named Colossal squid and Giant squid. Figure 4. 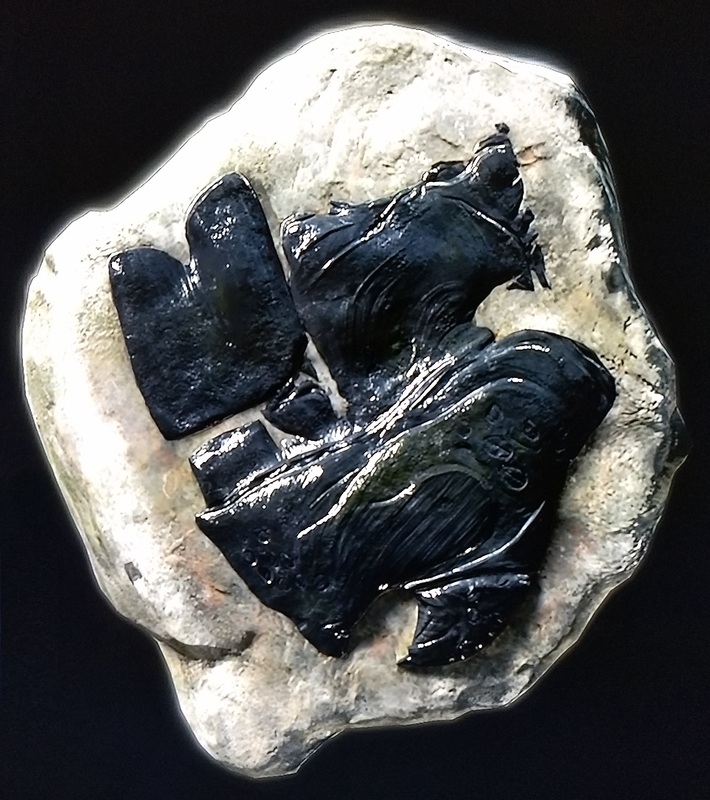 The fossil beak (lower jaw, viewed from several angles) of Haboroteuthis poseidon Tanabe, Misaki & Ubukata, 2015, a squid from the late Cretaceous period (roughly 85 million years ago) of Japan. Image reproduced from Tanabe et al. (2015: fig. 7). The Colossal squid, Mesonychoteuthis hamiltoni Robson, 1925, is the largest living cephalopod species in terms of body mass. It is very bulky, weighing up to half a ton and maybe even more. The Giant squid, Architeuthis dux Steenstrup, 1857, is actually the largest invertebrate alive – it can reach up to 20 meters (about 65 feet) in length, from the tip of its mantle to the tip of its long tentacles. However, Architeuthis has a slender build and even though it is larger, it weighs less than Mesonychoteuthis. Centuries ago encounters on the open sea with Architeuthis left Nordic seafarers in awe, giving rise to the legend of the Kraken (Salvador & Tomotani, 2014). But since Idril did not take her time to actually measure the fossil, we cannot estimate the body size of the Mordorian squid. Her estimate of several hundred feet is way larger than the “modest” 65 feet of Architeuthis and extremely unrealistic for any kind of animal (both soft-bodied and with a hard internal skeleton); thus, it can be dismissed as a guesstimate of someone without training in zoology. However, given the large “prehistoric” proportions of other animals in Tolkien’s legendarium, such as wargs and oliphaunts, we could expect the Mordorian squid to be really big – but good old Biology would not allow a much larger size than Architeuthis. But what about the Middle-earth canon? Did Tolkien provide us with some nice Kraken-like legends to settle this matter? Judging by videos and forum discussions on the Internet, most of the players that found the fossil in Shadow of War just considered it to belong to a monster akin to the “Watcher in the Water” from The Fellowship of the Ring (Tolkien, 1954a). Of course, that simply cannot be, because the Watcher is not a cephalopod; for starters, he is watching from a pool of freshwater. Its physiology and behavior do not really match those of cephalopods. The Watcher’s physical description (Tolkien, 1954a) is vague enough to match virtually any kind of “tentacled” monster; people just assume it is a cephalopod because of the tentacles (e.g., Tyler, 1976). In his Tolkien Bestiary, Day (2001) took a huge liberty and gave the name Kraken to the Watcher. Tolkien, however, never mentioned a Kraken (or cephalopods) in his writings – and surely did not relate that name to the Watcher (even in manuscript; C. Tolkien, 2002a). As Tolkien scholarship is very complex, I reached out to the American Tolkien Society just to be safe. They confirmed the absence of krakens and squid-like beasts in Tolkien’s works (A.A. Helms, personal communication 2017). We must remember, however, that the video games (including Shadow of War) are not part of the accepted Tolkien’s canon, which includes only the published writings of J.R.R. Tolkien and the posthumous works edited and published by his son Christopher. Games like Shadow of War are thus allowed to deviate from the core works and invent new things to amaze and surprise its players. And one of these things seems to be the fossil giant squid. Therefore, we can think of Shadow of War’s squid as a new discovery: a new species hitherto unknown to Science. New species discoveries always get the public’s attention, but few people actually know how scientists are able to recognize a species as new and what they do to formally describe and name it. So let us take a closer look at the whole process. The beaks of recent cephalopods have been widely studied by zoologists (e.g., Clarke, 1962; Nixon, 1988) and so they provide a good basis for comparison when someone finds a new fossil. By comparing the morphological features of the new find with previously known species, it is possible to decide if it belongs to one of them or if it represents a new species. Now let us imagine that the Mordorian fossil was compared to all known cephalopods and we discovered it is, in fact, a new species. How do scientists formally describe a new species and give it one of those fancy Latin names? The science of defining and naming biological organisms is called Taxonomy and it deals with all types of living beings, from bacteria to plants to animals. Zoologists have long ago come up with a set of rules for describing new species; it is called the International Code of Zoological Nomenclature, or ICZN for short. We are now in the 4th edition of the ICZN, from 1999. The “Code” gives us guidelines for naming species and for what is considered a good (or valid) species description. For a new species to be recognized by the scientific community, its authors (i.e., the scientists describing it) have to provide a set of crucial information: (1) a description or a diagnosis of the species; (2) a holotype specimen; (3) the type locality; and (4) a scientific name. So let me explain each of these. The description of a species is very straightforward: the researcher lists all the features (called “characters”) from the species. This includes morphology (e.g., shape, color), anatomy (e.g., internal organs), behavior (e.g., feeding habits, courtship), ecology (e.g., preferred prey), habitat, etc. As Mayr et al. (1953: 106) put it, the characters listed in the description are limited “only by the patience of the investigator”. The diagnosis, on the other hand, is a list of just those characters that distinguish the new species from all the other species in the same group (like a genus or family). The word “diagnosis” comes from the Greek and originally means “to distinguish between two things” (Simpson, 1961). Both description and diagnosis are written in a peculiar telegraphic way, which will seem very odd for people not used to it. The holotype is a single physical specimen chosen by the author to be the name-bearing specimen of the given species. That means the scientific name of the species is forever linked with that specimen and this will form the basis for the definition of the species. 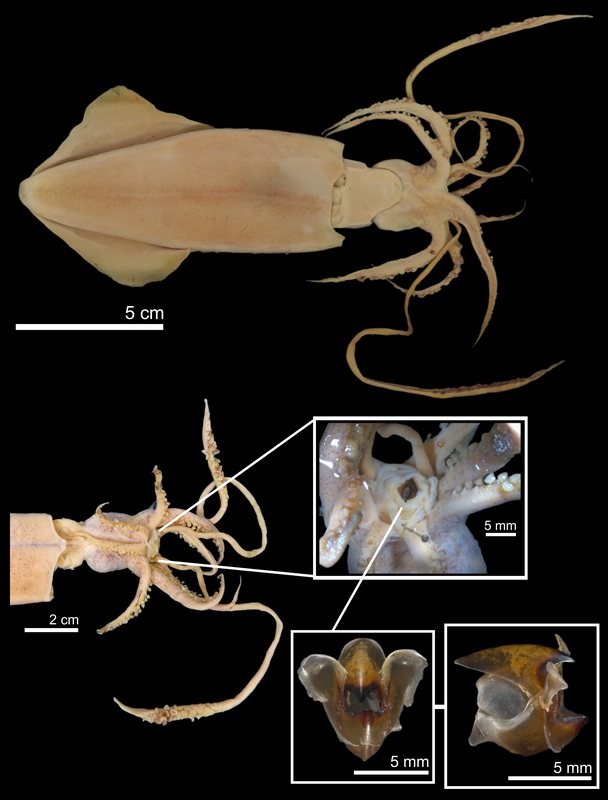 The holotype should ideally represent the species well, but this is not always the case: it can be an entire animal, such as a squid preserved in a jar of ethanol, or just part of the animal, such as the squid’s beak. The latter case is especially true for fossils, where the whole animal is not preserved. Finally, the holotype should be preserved and kept in a museum or university collection, thus allowing access to anyone interested in studying it. The type locality is the place where the holotype comes from; the more precise the locality (e.g., GPS coordinates), the better. For fossils, it is also common to indicate the type stratum, that is, the layer of rock where the holotype was found. Finally, the author gets to choose a scientific name for the species. The scientific names of species are formed by two parts; let us have as an example the species Corvus corax, the common raven. The first part is actually the name of the genus, Corvus, which includes not only ravens but also species of crows, rooks, and jackdaws. The second part of the name (corax) is called the “specific epithet”. However, one should always remember that the species name is not simply corax. The word corax by itself means nothing unless it is accompanied by the genus name. Thus, the complete name of the raven species is Corvus corax. When choosing the specific epithet, the author can use anything he wants, but most commonly people use a word that denotes: (1) a morphological feature, such as Turdus rufiventris, the rufous-bellied thrush (naturally, rufiventris means “rufous-bellied”); (2) the place where the species can be found, such as the Abyssinian thrush, Turdus abyssinicus (Abyssinia is a historical name for Ethiopia); (3) an ecological or behavioral trait, like the mistle thrush, Turdus viscivorus (viscivorus means “mistletoe eater”); or (4) a homage to someone, like Naumann’s thrush, Turdus naumanni, named in honor of the German naturalist Johann Andreas Naumann (the suffix “-i” in the specific epithet is the Latin masculine singular form of the genitive case). The explanation of where the name comes from is called etymology. Furthermore, when writing a scientific name, it is good practice to also include the authorship of the species; this means including the name(s) of the author(s) who originally described it. In the example above, the complete species name would be Corvus corax Linnaeus, 1758. Linnaeus is the scientist who first described the species and 1758 is the year he published the description. So now that the formalities of taxonomy were presented, let us see how our new Mordorian species could be described. If the species in question cannot be placed in an existing genus, a new genus might be described and the same ICZN rules above apply. So let’s start by naming the genus Mordorteuthis n. gen., which reflects the place where the fossil was discovered (“teuthis”, from the Greek, means “squid”). The new species could then be formally described as Mordorteuthis idrilae n. sp., named in honor of Idril (the suffix “-ae” in the specific epithet is the Latin feminine singular form of the genitive case). The holotype would be the specimen recovered by Talion (Fig. 1) that originally belonged to the treasury of Minas Ithil. For safekeeping, the holotype should then be handed over to a decent academic institution, like the Royal Museum of Minas Tirith (yes, I just invented that). The type locality would be Mordor, close to the Sea of Núrnen; the type stratum, however, remains unknown, as this information is not provided in the game (it is suggested, however, that the fossil was found on a beach of the Sea of Núrnen). The diagnosis should give a list of features (such as its large size) that can distinguish it from other fossil squids from Middle-earth; a hard task, given that this is the very first fossil squid described from Middle-earth. The description would be a full account of the fossil’s shape, proportions, and fine structures; this can be boring even for trained taxonomists, so I won’t do it here (for an actual example, see Tanabe & Hikida, 2010). Finally, we might glimpse some information about the squid’s habitat: the fossil was found close to the Sea of Núrnen, which is an inland saltwater lake, like our Dead Sea (Tolkien, 1954b). Both the Sea of Núrnen and the Sea of Rhûn to the north are thought to be remnants of the old Sea of Helcar from the First Age (Fonstad, 1991; C. Tolkien, 2002b). The Sea of Helcar would be much larger and thus, perhaps a fitting place for large squids to thrive. Besides, its old age makes it a likely point of origin for a fossil. Of course, a new species description is only valid if published in the scientific literature. Therefore, our little flight of fancy with Mordorteuthis idrilae here is not a valid species description, but it can sure serve as a nice introduction to taxonomy and to how scientists describe new species. Finally, it is always worthwhile to mention that several taxonomists have paid homage to Tolkien by naming their genera and species after characters and places from his writings (Isaak, 2014). For instance, we have the genera Smaug (lizard), Beorn (tardigrade), and Smeagol (snail), and the species Macropsis sauroni (leafhopper), and Bubogonia bombadili and Oxyprimus galadrielae (both fossil mammals). But there are many others. That may be inevitable in a sense, as several nerds end up becoming scientists. In any event, geeky names such as these sure make an otherwise arid science a little bit more colorful. Boyle, P. & Rodhouse, P. (2005) Cephalopods: Ecology and Fisheries. Blackwell Science, Oxford. Clarke, M.R. (1962) The identification of cephalopod “beaks” and the relationship between beak size and total body weight. Bulletin of the British Museum (Natural History), Zoology 8: 419–480. Day, D. (2001) Tolkien Bestiary. Random House, New York. Fonstad, K. (1991) The Atlas of Middle-earth, Revised Edition. Houghton Mifflin Harcourt, New York. International Commission on Zoological Nomenclature. (1999) International Code of Zoological Nomenclature, 4th ed. The International Trust for Zoological Nomenclature, London. Isaak, M. (2014) Curiosities of Biological Nomenclature. Etymology: Names from Fictional Characters. Available from: http://www.curioustaxonomy.net/etym/fiction.html (Date of access: 11/Jan/2018). Mayr, E.; Linsley, E.G. ; Usinger, R.L. (1953) Methods and Principles of Systematic Zoology. McGraw-Hill, New York. Miserez, A.; Schneberk, T.; Sun, C.; Zok, F.W. ; Waite, J.H. (2008) The transition from stiff to compliant materials in squid beaks. Science 319(5871): 1816–1819. Nishiguchi, M. & Mapes, R.K. (2008) Cephalopoda. In: Ponder, W.F. & Lindberg, D.R. (Eds.) Phylogeny and Evolution of the Mollusca. Springer, Dordrecht. Pp. 163–199. Nixon, M. (1988) The buccal mass of fossil and Recent Cephalopoda. In: Clarke, M.R. & Trueman, E.R. (Eds.) The Mollusca, Vol. 12, Paleontology and Neontology of Cephalopods. Academic Press, San Diego. Pp. 103–122. Rosenberg, G. (2014) A new critical estimate of named species-level diversity of the recent Mollusca. American Malacological Bulletin 32(2): 308–322. Salvador, R.B. & Cunha, C.M. (2016) Squids, octopuses and lots of ink. Journal of Geek Studies 3(1): 12–26. Salvador, R.B. & Tomotani, B.M. (2014) The Kraken: when myth encounters science. História, Ciências, Saúde – Manguinhos 21(3): 971–994. Simpson, G.G. (1961) Principles of Animal Taxonomy. Columbia University Press, New York. Tanabe, K. (2012) Comparative morphology of modern and fossil coleoid jaw apparatuses. Neues Jahrbuch für Geologie und Paläontologie, Abhandlungen 266(1): 9–18. Tanabe, K. & Fukuda, Y. (1999) Morphology and function of cephalopod buccal mass. In: Savazzi, E. (Ed.) Functional Morphology of the Invertebrate Skeleton. John Wiley & Sons, London. Pp. 245–262. 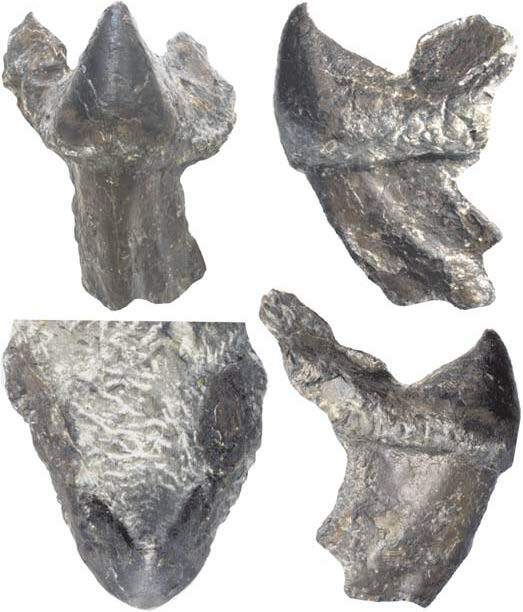 Tanabe, K.; Misaki, A.; Ubukata, T. (2015) Late Cretaceous record of large soft-bodied coleoids based on lower jaw remains from Hokkaido, Japan. Acta Palaeontologica Polonica 60(1): 27–38. Tennyson, A.L. (1830) Poems, chiefly lyrical. University of Pennsylvania Press, Philadelphia. Tolkien, C. (2002a) The History of Middle-earth II. HarperCollins, London. Tolkien, C. (2002b) The History of Middle-earth III. HarperCollins, London. Tolkien, J.R.R. (1954a) The Fellowship of the Ring. George Allen & Unwin, London. Tolkien, J.R.R. (1954b) The Two Towers. George Allen & Unwin, London. Tyler, J.E.A. (1976) The Complete Tolkien Companion. St. Martin’s Press, New York. Brown, R.W. (1956) Composition of scientific words. Revised edition. Smithsonian Books, Washington, D.C.
Mayr, E. & Ashlock, P.D. (1991) Principles of Systematic Zoology, 2nd ed. McGraw-Hill, New York. Salvador, R.B. (2014) Geeky nature. Journal of Geek Studies 1(1-2): 41–45. Winston, J.E. (1999) Describing Species: Practical Taxonomic Procedure for Biologists. Columbia University Press, New York. Wright, J. (2014) The Naming of the Shrew: A Curious History of Latin Names. Bloomsbury Publishing, London. I am deeply grateful to the people from the American Tolkien Society (Amalie A. Helms, Connor Helms, and Phelan Helms) for the information about “krakens” in Tolkien’s works; to Dr. Philippe Bouchet (Muséum national d’Histoire naturelle, Paris, France) for the help with ICZN articles; and to Dr. Barbara M. Tomotani (Netherlands Institute of Ecology, Wageningen, The Netherlands) and Dr. Carlo M. Cunha (Universidade Metropolitana de Santos, Santos, Brazil) for the permission to use, respectively, Figures 2 and 3 here. Dr. Rodrigo Salvador is a malacologist who has made his peace with the fact that virtually no one knows what a malacologist is. In case you’re wondering, it means “a zoologist specializing in the study of mollusks”. Despite being a Tolkien fan through and through, he does think that Middle-earth could use more zoological diversity. Called “cuttlebone” in cuttlefish and “gladius” or “pen” in squids and octopuses, although some lineages have completely lost the shell. Other cephalopods, like the nautilus, have very prominent external shells, as is the norm for other mollusks (e.g., snails, clams, etc.). Since people always get this wrong, just let me clear things up: squids have 8 arms and 2 tentacles, while octopuses have 8 arms and no tentacles whatsoever. Day also took another huge liberty in using the opening verses of the poem The Kraken (Alfred Lord Tennyson, 1830) without giving proper credit to the poet. Being stricter, the Watcher, like the Nazgûl’s flying mounts, remained nameless. Botanists (and mycologists) have their own code, the International Code of Nomenclature for Algae, Fungi, and Plants. Bacteriologists have their code as well, the International Code of Nomenclature of Bacteria. The abbreviation “n. gen.” after the name means “new genus” and indicates that the genus is being described here for the first time. Likewise, “n. sp.” means “new species” and indicates that the species is being described here for the first time. The nomenclatural acts on this article are presented simply for hypothetical concepts (a Middle-earth squid) and are disclaimed for nomenclatural purposes, being thus not available (ICZN Articles 1.3.1 and 8.3). In earlier writings, the names are usually spelled Nûrnen and Helkar.